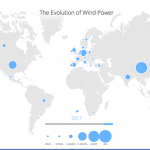 Greenbyte shares infographic on renewable energy in the U.S.
Renewable energy software company, Greenbyte, has gathered the data for renewable energy in the U.S. The infographic focuses on data for wind, solar, and hydro, and highlights the most recent data for capacity growth including those states that are topping the renewable charts. Greenbyte aims to provide the leading independent software service for the growing renewable energy industry through which renewable energy owners, operators, and other stakeholders can obtain valuable insights leading to increased profit. “Overall, the data in the USA infographic was an interesting reveal for us and gave us a clearer insight in the industry. We aim that it does the same for all the readers,” said Larsson.